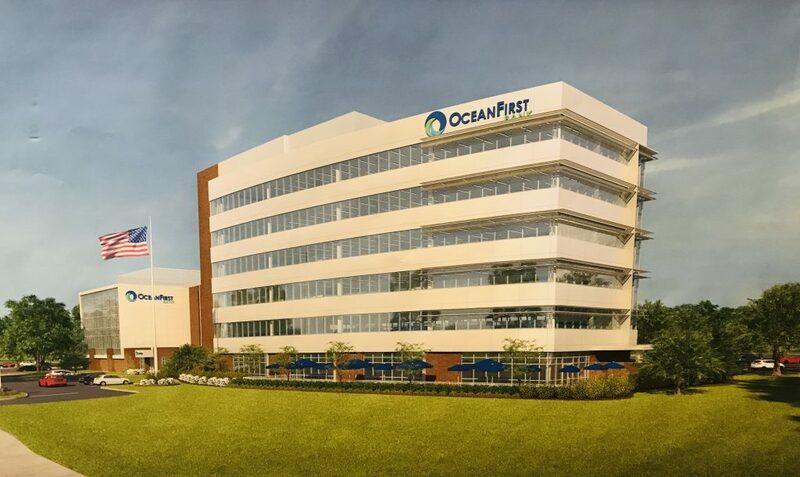 OceanFirst Bank received the go-ahead from the Toms River planning board on Wednesday night to construct a new, seven-story headquarters building on Hooper Avenue that will stand 97-feet tall. The towering building will be constructed just to the south of the bank’s current headquarters, located at 975 Hooper Avenue, which will remain standing. The new structure will be built on a portion of the plot that is currently undeveloped and will include a reapportionment of the existing parking lot to add more spaces. The 79,000 square foot building will create 175 new permanent jobs and is estimated to be a $20 million ratable for the township, said attorney Harvey York, who represented the bank before the board. Though the building will be one of the tallest in Toms River, it is unlikely that it will contribute much in the way of extra traffic, York and an engineer hired by the bank said. The retail portion of the bank will actually be significantly reduced – from 8,000 square feet to 2,700 square feet – since there is less demand than in the past. There were no formal objectors to the project, however three residents from Edken Avenue, a nearby street, raised concerns about traffic, prompting the discussion on the role of the new building. In recent years, OceanFirst has gone through a major expansion throughout South Jersey, purchasing Cape Bank, Sun National Bank, Capital Bank and Ocean City Home Bank. “You will continue to have a corporate headquarters of what is now a very large bank,” York told board members. The headquarters building will be representative of a modern corporate environment, including 13,000 square feet of space for a cafeteria and amenities such as an employee gym with lockers and showers. Scott Kennel, the traffic engineer, said 80 percent of the traffic entering the property will do so from Hooper Avenue. It is expected that most drivers will initially approach from the north and cross Hooper to get to their destination. The remaining 20 percent will likely be routed to Edken. The bank’s representatives said the property will be improved with 200 additional trees and 875 plants. York also promised to work with the owner of the closest residential property to shore up a tree barrier that was installed when the existing bank building was first constructed. The board granted a minor variance, allowing the bank’s logo to be placed on the facade above the top floor of the building. Toms River’s sign ordinance has not been updated to reflect its new zoning ordinance that allows taller buildings. The logo will be relatively small, and improvements will be made to the entire site to make it more aesthetically pleasing. “We’re going to blend them into the existing landscaping so it doesn’t look odd, and we’re also going to replace much of the lighting to bring it up to current code,” said planner Brian Murphy. The board approved the project with a unanimous vote.